Want to help people smile? Dental assisting may be the career for you. 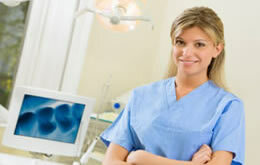 A talented Dental Assistant is an integral part of the dental health care team. The easiest way to begin a career in dental assisting is to receive high quality training. Our program provides affordable education utilizing the latest technologies and emphasizes the clinical skills necessary to gain employment. The best and quickest way to become a dental assistant is to receive specialized, professional training. Our program provides education that is based on the very latest procedures and techniques.